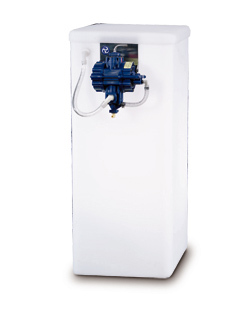 This inert-gas (C02 or otherwise) powered auto-fill pump system for slush & cocktail freezers features a detachable pump mounted to a 15-gallon plastic tank. Clocking at 45 gallons per hour (approx. ), this system is also wired for easy cleaning–just pump cleaning solution through the hose and you’re done!